Should Nashville want to be considered a mini Silicon Valley? Those are just some of the questions facing Nashville with the impending arrival of Amazon and its 5,000-job Operations Center of Excellence. Construction has already begun on the 15-acre campus at the $1 billion Nashville Yards project, which also will include retail, apartments, an entertainment center and a Grand Hyatt luxury hotel. And it’s not just Amazon. Nashville is now home to tech-enabled companies like AllianceBernstein, Lyft, UBS, Ernst & Young, Eventbrite, Postmates and Houzz, among others. The doughnut counties surrounding Nashville have also seen growth in luring tech industry, most notably in Montgomery County where Google is building a $600 million data center. Business, government and education leaders agree Nashville is the hub of a growing tech region. “If we ask the question ‘what does it take or mean to be a tech city’ from a software development perspective, I see it as more about creative problem-solving than it is about specific technologies,” says Gaines Kergosien, vice president and development manager of corporate systems for AllianceBernstein (a leading investment management and research firm) and founder and executive director of Music City Tech. Kergosien compares writing software to the efforts of Music City’s prolific songwriters. “It’s a nuanced process that focuses more on understanding the business needs – and finding creative solutions to those needs – using the toolkit that’s available to you rather than learning what the right answers are to any given question. So that’s where the creativity comes in,” Kergosien adds. “You find that same sort of system in music where there are patterns that are very common, and that there’s a system of how the notes work together. There’s not necessarily one right or wrong answer when we composing music so much as guidelines and things that people have found to work well. That’s where the culture of musical creativity meshes really well with the software development world. 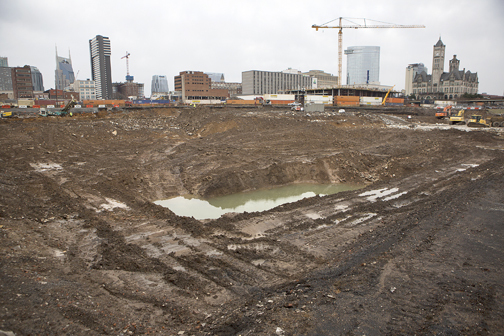 It may be just a soggy hole now, but this Nashville Yards site will soon be home to Amazon’s Operations Center of Excellence. What else does Nashville have going for it, a well-known creative energy. There are plenty of concerns and debate over the first point, but little argument about the second. Area universities – public and private, two-year and four-year – have made technology a priority. “As an academic, I’ve spent the past 10-12 years working to connect our academic and industry communities,” says Belmont professor Glenn Acree, who teaches in the Math and Computer Science Department. “What I’ve found and love about the local tech community is that it is open, engaging and eager to mentor our students. In fact, it is open to engaging anyone with genuine interest in strengthening the tech/development/data community. “If you think about it – automotive, music, health care – these may not be your typical tech shops, but they are certainly dependent upon (and driven by) technology. 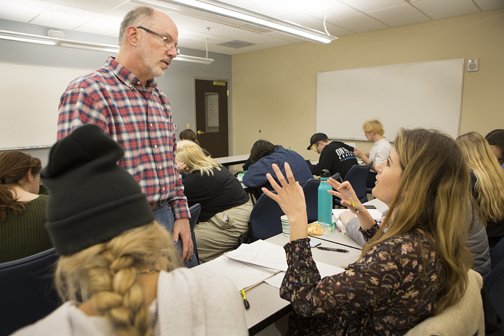 Belmont University math professor Glenn Acree, standing, helps student Marita Prodger with a question during a general education math class. Acree joined other academics, students and businessmen in late January at the MTSU Computer Science “Hack MT” competition in Murfreesboro. Nashville’s growing reputation as a tech savvy city was a hot topic. “I think it’s really hard to determine what makes a tech city, or the tech industry in general, because tech industry is woven so strongly into like a lot of other industries,” Kent Unruh, a software developer at Nashville-based L3 ForceX, a U.S. Defense Department contractor, said at the event. “A lot of the technical jobs we have here are doing projects for health care, we’ve got government contracts, even the music industry needs their own software. 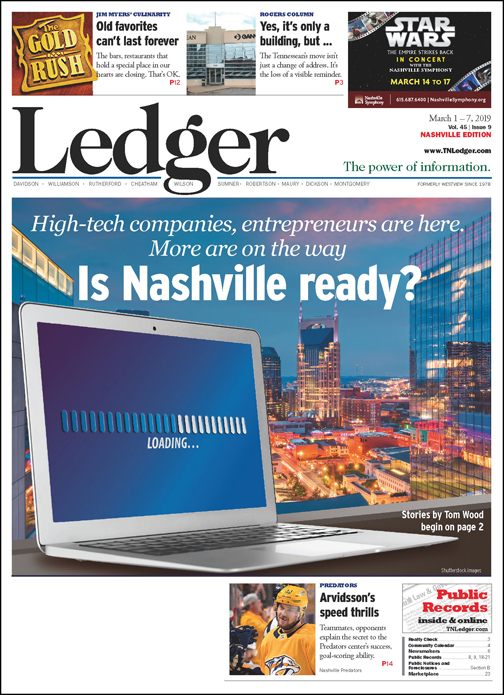 Nashville – which in 2013 was hailed by the New York Times as the next “it city” – may be on track to become the next “IT City” on par with Seattle, Austin and Silicon Valley. Jennifer Darling, Tennessee territory account manager for Panduit, a network infrastructure and industrial electrical wiring solutions company, says other cities are more proactive about what tech advances are available. “(Nashville officials) don’t promote it as that, definitely,’’ she says. “Some places like Chattanooga, Bristol, Virginia, utility companies do. “Chattanooga EPB has done what they call ‘Gig City,’ that they’ve run fiber and they run fiber to the home and provide a big bandwidth for that. We do have that with Xfinity and AT&T, and now Google Fiber is coming here. But I don’t know that we promote our technology that we have. And, no one is questioning if Nashville is growing. “When you look at Nashville, it’s the environment that Nashville is trying to create. We may not have the number of tech jobs that some of these other bigger cities do, but we are definitely growing,” says Todd Harris, human resources manager for L3 ForceX. “Obviously, all you have to do is look at the traffic patterns to see what is going on with the city. The culture and environment, what you’re seeing a lot of the local software companies doing is trying to emulate Silicon Valley and Seattle. Harris calls software “a vehicle” for change … change that could impact the city, the state and society in ways yet unimagined. He cited last year’s U.S. Supreme Court decision that lets each state decide if it wants to legalize sports betting. Such a bill has been introduced in Tennessee. “Baseball’s a perfect example of where technology has changed how they play that game,” Harris adds. “And then of course with the legalization of gambling now, there’s going to be a whole lot of technology surrounding that. “So, software is a vehicle, it’s everywhere, but … you look at the number of colleges with MTSU, Belmont, Vandy, all of those organizations are focusing on their science technology. Tennessee has done a great job of focusing on their STEM programs. Tim Choate, president and CEO of Bondware Web Solutions, has a long-term perspective, having started his company in Murfreesboro in 1999. “It’s getting there,” he says of Nashville’s tech credibility. In early February, Amazon hosted an event at Ryman Auditorium that included officials from MTSU and Vanderbilt. MTSU president Sidney McPhee said his school has been involved in the process of bringing Amazon to Nashville from the beginning. “As a large university with a large information system program … we’re not training students to do esoteric work, but we are training them and educating them to be able to go out and get jobs that would make Nashville always an attractive city for high-tech,” McPhee said. Zube Molokwu, an MTSU senior majoring in computer science, will graduate in fall and then head to San Diego for an internship with Qualcomm. Charles Apigian, who teaches in MTSU’s Department of Information Systems and Analytics, also is director of the school’s Data Science Institute. He sees Nashville as a welcoming community for tech industry. What you’re seeing is that when companies look for new places to go, they’re looking for a certain type of culture and community when it comes to technology that Nashville is able to breed here,” says Apigian, who serves on the board of directors for the Nashville Technology Council. Apigian’s Hack MT team won the Hackers Choice Award for its entry and took second place in the Professional Choice Award for its innovative work with Second Harvest Food Bank. Frank Ellmo, the senior director of operations for Second Harvest Food Bank of Middle Tennessee, cited the MTSU plan for warehouse expansion as one way technology can help a previously low-tech nonprofit. “The Food Bank just expanded to three facilities in Middle Tennessee, so we serve 46 counties, partner with 500 agencies to rescue food and get it out to food-insecure people,” Ellmo explains. “So, this technology gives us kind of the quantum leap into being able to optimize operations across 46 counties through three buildings and with our own little 18-truck fleet. But we get it all done every day. Kristin Mumford, MNPD public affairs officer, says that’s still the case until the right software can be purchased and put in place. She adds there is no timetable for a switch. “We’re in the process of making all of our forms electronic, and you can imagine the amount of paperwork and forms that we have,” she acknowledges, adding that misdemeanor arrest and crash reports are already filed electronically. Mumford says Metro used an electronic system for writing those tickets “a few years ago” but had to halt it. Seattle Councilwoman Teresa Mosqueda offered her insight this month when Stand Up Nashville, a coalition of “community organizations and labor unions that represent the working people of Nashville who have seen our city transformed by development, but have not shared in the benefits of that growth,” hosted an informational meeting at East Magnet School. Odessa Kelly and Anne Barnett, co-chairs of Stand Up Nashville, say tech growth is important to Nashville’s future, but so are adequate pay, housing and infrastructure. Those are lacking right now, they add. Asked if Nashville is a tech savvy city and whether that’s a good or bad thing, Barnett paused thoughtfully before answering. And that, in a sense, is the quandary Nashville finds itself in as far as a growing tech savvy reputation goes. If Nashville isn’t at the forefront of luring new tech industry and lets it go to other cities, then Nashville will be left behind.